You’re doing what on the what? We are thru hiking the Pacific Crest Trail. And if you don’t know what that means, read Part 1 here. Now I’ll continue the FAQ. What’s the highest point on the trail? Forrester Pass, at 13,153 feet in the Sierra Nevada. We hope to take a side trail to ascend Mt. Whitney, at 14,494 feet elevation, which would make it the highest point of our journey. It is also the highest point in the contiguous United States. What’s the lowest point on the trail? Cascade Locks, at 140 feet above sea level, in the Columbia River Gorge in Oregon. How much will your packs weigh? The base weight (base weight is everything you are carrying with you, including the weight of your pack, and excluding food and water) of my pack will probably be around 12 pounds. Jason’s will probably be around 15 pounds, because he is carrying the tent, and our cooking stuff. That means the full weight of our packs when we are headed out of resupply points will be me: 35 pounds, Jason: pushing 40 pounds. The further we hike away from resupply points the more food and water we consume; thus, the lighter our packs become. How many miles a day will you hike? We need to average about 17 miles per day in order to make it to the end of the trail before the snow falls in Washington. This average includes any zero days we’ll take. A zero day means a rest day; zero miles completed. At the beginning we’ll start out at about 10 miles a day, slowly building closer to 20. Mileage will also depend on the terrain we’ll be traveling on for the day. We’ll make more miles during flat stretches, less when we are climbing in elevation. Making it to resupply points during post office and store hours is also a factor in how many miles a day we travel, and if we need to do laundry in town, etc. multi-tasking -training while getting housework done! How are you training for your hike? 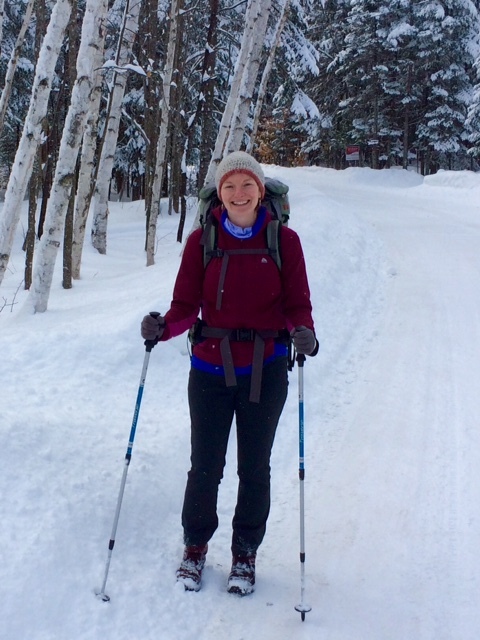 It is the dead of winter right now in Maine, so although we are getting out to do some hiking, weather and work schedule prevent us from doing a lot. It’s pretty tough to simulate hiking miles and miles day after day. They say, the real training begins on Day 1 of the hike. Not until hiking the actual trail, do you really start to get in long-distance hiker shape. That being said, there are still some things you can do to prepare, which, I feel, are pretty important. I am doing a lot of strength training, focusing on my core and legs. For those of you that don’t know, I tore my ACL last January, and will be about 1 year 1 month post knee surgery when we start the trail. So, for me, building the strength, balance, and confidence back up in my right leg has been very important. Luckily, I am friends with an amazing personal trainer who set me up with an awesome training program I have been doing for the last 10 weeks, increasing in difficulty as I get stronger. This is what my weekly exercise plan looks like. Actually, this would be an ideal week, which hardly ever happens. Strength training at the gym or a less intense home program, focusing on core and lower body, with a little upper body thrown in for good measure (2-3 times a week). Endurance, which, when the weather is good, includes a hike. When it’s not, I spend a long time at the gym doing a combination of slow jogging, swimming, and biking (once a week). Cardio Intervals. I usually do this on my strength days at the gym, but sometimes just by itself. I will do a combination of running on the track and treadmill (soon, with the extra daylight and warmer temps, I can start running outside again! ), or a swim (2-3 times a week). Rest day, at least once a week, but often, for various reasons, it’s more than that. What else? 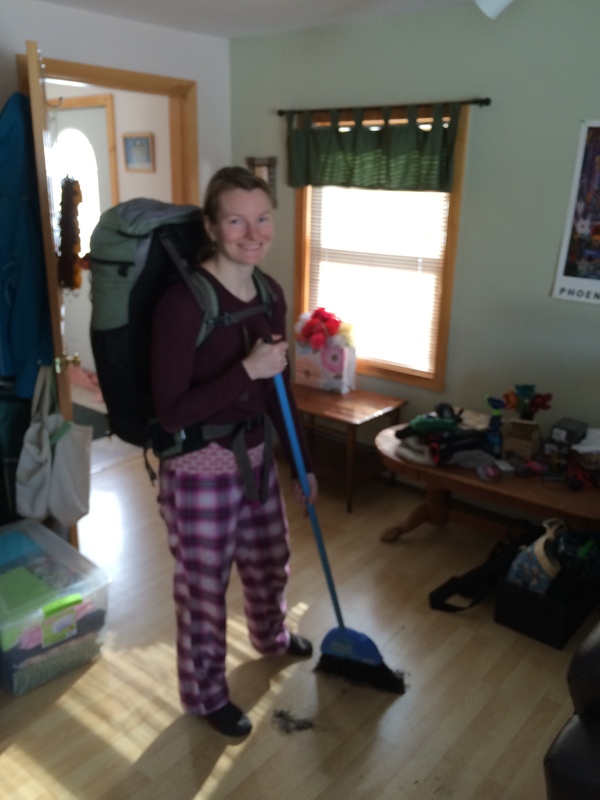 We also wear our weighted packs around the house, while doing cooking or cleaning (I actually sweep more now that I’m wearing my pack! ), or on walks down to our mailbox. I also have a pretty consistent yoga practice, which includes meditation. Although, I have to admit, since I’m exercising a lot more, some days this takes a back seat. What has Jason been doing to train? Well, since he’s less schedule-oriented than I am, his training is a little (a lot) less regemented. He wears a heavily-weighted pack while pacing around the house, doing walking lunges, and various other strength exercises, runs on the treadmill a little, and of course, accompanies me on our hikes. We also spend a lot of evenings reading books and blogs and researching for the journey as well. How excited are you to be doing this? Anything I forgot to cover? Ask away! Categories: PCT, PCT FAQ, Pre-hike | Tags: backpacking, long distance hiking, Pacific Crest Trail, Pacific Crest Trail Thru Hike, pack weights, PCT, PCT blog, PCT FAQ, PCT prep, preparing for a long distance hike, thru hiking, training for a long distance hike | Permalink. I just thought you might want to know, there is a beautiful hotel that runs right next to the trail. I am not sure what it is called but it is in White Pass, Washington. When I went there, the people next door to us were just staying the night and in the morning they were going to head back out on the trail again! It’s also the place where we cought our pet frogs. Very cool! We’ll have to look into it! What animals do you think you’ll see on your trip? That does sound cool. I’m not quite sure what animals we’ll see, but I’ll keep you posted once we start! I bet we may see a few that we don’t have on the east coast. Cool! Do you have the Western Meadowlark on the East coast? I don’t think so. I just Googled it, it is a pretty looking birds. I’ll try to get pictures of any animals I can’t identify and maybe you can help me!